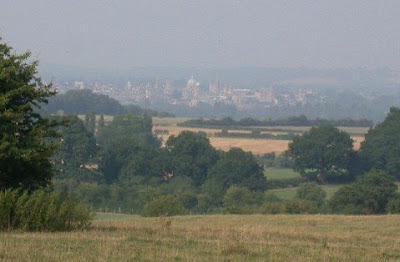 Oxford in her July haze from Boars Hill, where I was born. Oxford nestles in her river valley surrounded by wooly rural hills, which,as i mentioned in a previous blog, this time of year are full, as if snow covered, with Hawthorn Blossom. Over the previous few days the weather in the UK is what we, in our understating way, call "Changeable"...ie: blustery gales and four seasons in one day. Its always sad to see the tiny white petals stripped from the trees and bushes, almost prematurely, creating carpets of white on the grass, causing Englishmen to quote the line:- " Rough Winds do shake the darling buds of May"
The phrase "Darling Buds of May" refers to the opening buds that point toward the warm summer season ahead and to the freshness and exuberance of youth as it turns toward adult maturity. It probably refers not to the month of May directly but to the May tree (the Common Hawthorn) that flowers in England at this time of year. The hawthorn is important in the mythology of old England and there's a rich symbolism wrought from its standing as an early flowering common tree. Global warming has now given the UK a climate that causes May to begin flowering earlier, but I doubt that the 'darling buds of April' will ever catch on. The legend of the Glastonbury Thorn is also related to the flowering time of the hawthorn. The story has it that when Joseph of Arimathea arrived in England from the Holy Land he stuck his thorn walking stick into the ground and it began to flower, and continues to flower each year at Christmas to mark Christ's birth. That's a myth but there are some facts that give it a little credence. The Glastonbury Thorn is unusual in that it does flower during the winter. There is a middle eastern form of the tree that flowers at that time and some would have it that this is what Joseph brought with him. Not all the symbolism relating to the hawthorn is warm and inviting. The tree also has negative associations. In Ireland a hawthorn standing alone in open ground is known as a fairy tree and there is a strong superstition that to cut one is unlucky. Even in recent years roads in Ireland have been rerouted to avoid uprooting hawthorns. It is also considered unlucky and an omen of death to cut the blooms and bring them into a house. This may well have come about from the unpleasant aroma, which is like decaying flesh. Thank you for the botany/history lessons and the pictures. I enjoy your posts and will be looking for more of the same. Why thankyou Lady Tammy and Sir Richard, I really appreciate your comments..
.........as they come, unbeknownst to you, just after I had a nightmarish day when my internet connection refused to operate properly. AOL UK were having a few problems...,and as my work involves many many design and article based emails a day, i once again got to glimpse the dark side of my nature, brought on by the modern frustration that we are too in hock to this "interweb monster". Still...AOL UK have sorted it all out and I'm sure that was a collective sigh I heard across the shires this morning as England awakes to find their terminals buzzing at the proper speed again....and your comments further lighten my mood. It appears that the rough winds have also blown away the AOL UK server too! Looking forward to the hazy days of July with you in Oxfordshire.